The apostle Paul got rightfully angry with the Galatian Christians who had fallen away from grace, because they were attempting to earn favor with God by their own behavior. The problem was, they already had perfect favor! They already had every blessing! Jesus had given it to them—in full. To believe otherwise was to believe a lie and to give themselves to that lie through their efforts. That’s how people get twisted and disappointed. Have you noticed? Believing that we have to tithe, pray, worship, sing, witness, fast, or love in order to gain favor with God is anti-Christ. Doing something apart from Jesus in order to get what He presumably failed to secure is not only worthless, it is against the truth. That’s awful. For the Galatian Christians to add Jewish customs or ceremonies or rule-keeping to a supposed required mix was to put themselves under a curse! In other words, by faith in Jesus, we get the Holy Spirit and everything that He brings with Him. You would be wise to assume that He doesn’t lack anything. Every other hope with God, any other obligation-based hope with God is shadow living—it’s performing in the dark!—even though the reality has come (Colossians 2:16-17). 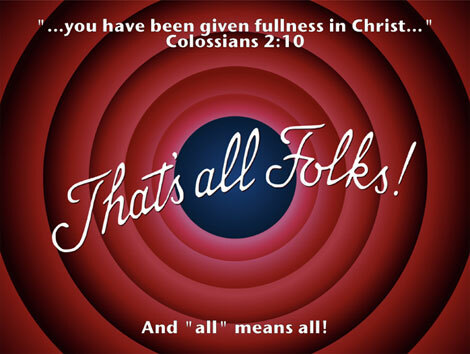 In Christ—which is where we are now—we have how many things? All things. That’s the incredible gospel we love! That’s the stunning New Covenant. And that’s why we’re crazy in love with Jesus. We’re out in the open about it! No one’s hiding this. We want to tell everyone, and we want to remind those who have forgotten and been lured back into the shadows. Come on out of there! No more performing in the darkness! Lies will have you there, and we won’t be a part of that; neither will God. Because of Jesus, we have it all. And that’s all, folks.